Volvo Cars’ 360c: why fly when you can be driven? Imagine a world in which you travel long distances without the need for airports. A world in which you can avoid airport security, hours of queuing and waiting, and noisy, cramped airliners. What if, instead, you could take your own first-class private cabin that picks you up at home and takes you from door to door? 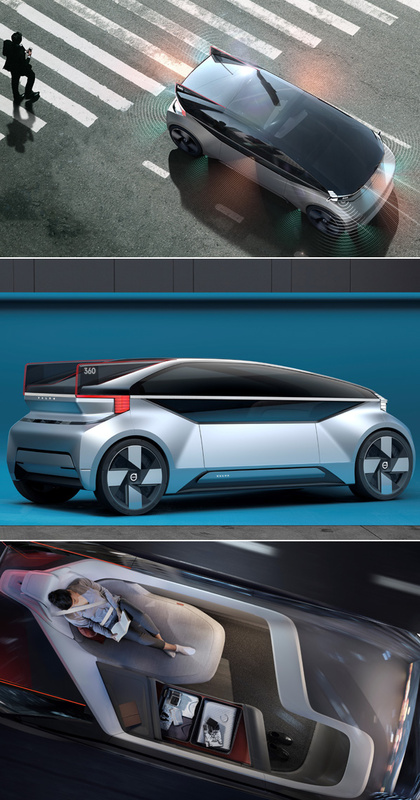 It is this vision for the future of autonomous travel that Volvo Cars revealed this week with its new Volvo 360c concept, a holistic view of a future of travel that is autonomous, electric, connected and safe. It could open up new growth markets for Volvo Cars, for example in the multi-billion-dollar domestic air travel industry. The basis of the 360c is a fully autonomous, fully electric car without a human driver. The concept capitalises on the freedom in design afforded by the absence of a steering wheel and a combustion engine, providing the ability to reimagine the traditional placement of passengers in rows of two or three. The 360c represents a potentially lucrative competitor to short-haul air travel, a multi-billion dollar industry comprising airlines, aircraft makers and other service providers. Especially shorter routes where the distance between origin and destination is around 300 km are prime candidates for disruption by an alternative mode of travel. For example, within the US over 740 million travellers embarked on domestic flights last year and America’s domestic air travel industry is worth billions of dollars in revenue. Several busy domestic air routes, such as New York to Washington DC, Houston to Dallas and Los Angeles to San Diego, are more time-consuming by air than by car when including things such as travel to the airport, security checks and waiting times. Beyond new potential customer groups for Volvo Cars’ business, the 360c also carries implications for the future of travel, city planning, infrastructure and modern society’s environmental footprint. It does not just reimagine how people travel but also looks at how people engage with friends and family while on the move, and how they can recapture time while travelling in the cities of the future. The 360c is a first yet deliberate step towards a broad discussion about the potential for autonomous driving technology to fundamentally change society in many ways, says Volvo Cars.